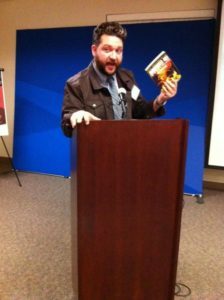 A kid at heart, Eric Kallenborn began reading comics when his dad would take him to the local candy store, when he was 10, to pick up a few comics. An only child, those comics kept him out of his parents’ hair. But, a love developed, and now, he loves comics more than ever! 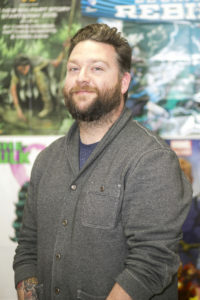 He has been teaching high school English for over 10 years, and over the course of his career, he has taught many comics and graphic novels, even working to get a Graphic Novel English elective adopted by his school district. Has has a supportive administration to thank for being open to the art-form, but with the research that he’s done, and the success that he’s seen, there is no doubt that comics have a place in the classroom, and it takes dedicated people to solidify that place. Eric Kallenborn’s work has been featured on the cover on the Chicago Sun Times and the Chicago Tribune as well as many other national publications, he has written educational articles on the use graphic novels in the classroom for Heinemann, The Chicago Architecture Foundation, and Pop Culture Classroom. 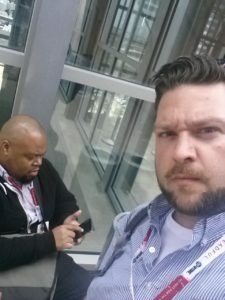 He has developed programming for and presented at a number of comic and educational conventions, including keynote speaking this past November at NCTE with award-winning graphic novelist Gareth Hinds and fellow teacher Ronell Whitaker. He has also spoken on panels with such talents as Gene Luen Yang, Craig Thompson, Nick Dragotta, Kazu Kibuishi, Cecil Castellucci, and Jonathan Hennessey. Please contact for speaking engagements, professional development opportunities, lesson plan assistance, or just to chat comics! 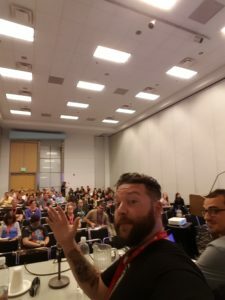 He is currently part of an amazing group of educators assembling a team to get the word out about the importance of cultural literacies, with a focus on gaming, film, music, and comics. The group sets itself apart from other organizations by having a “By Teachers, For Teachers” focus. Lit-X is coming, and you should be excited! Eric- It’s Mrs. Haan, your HS teacher. I just wanted to say that I’m so proud of you and your efforts to bring these titles to life. Good job! By the way, I teaching at Chicago Christian. David Z. alerted me to your blog. I investigated and am impressed! Hi Eric, thanks so much for such a glowing and appreciative review of our book, Operation Ajax! The stuff you focused on in your review was some of the stuff we worked the hardest on, and it’s really great to see it was working for you. Much appreciated.